God in our thoughts, God in our hearts, God on our lips, loving awareness of God, affective presence of God — this will be our happy state once we have put into practice the different ways of living in God’s presence. Two acts, thinking of God and loving God, make up the exercise of the presence of God. Thinking of God leads to loving Him. These two acts should not be divorced, any more than a flower should be torn from its stem. Let us now consider the acts of the will by which we can fan this recollection into flaming love for God. This is the goal upon which all ways converge, and this direction of our will, from a practical standpoint, is more important than the acts of the intellect by which we think of God. Prayer consists not so much in merely thinking of God as in loving Him. Dogged perseverance in the art of thinking of God will draw our hearts into closer union with our divine Friend, who, in turn, will gently urge us to desire to do His will, to long for greater intimacy with Him, and to speak to Him the language of love. When we have arrived at this stage, we find that acts of love and praise come more easily to us. We find ourselves turning to God within us, addressing Him with short, fervent acts of hope, love, and praise — acts that flow naturally and easily, and at times with the rhythmic regularity of our breathing. When these acts are frequent and regular, they are a sign that we have fallen deeply in love with God and now enjoy true intimate friendship with Him. These hidden desires, these expressions of love, we call aspirations, or the prayer of aspirations. This article is adapted from a chapter in Fr. Healy’s Awakening Your Soul to the Presence of God. Click image to preview or order. What, precisely, is an aspiration, or the prayer of aspirations? An aspiration, like prayer in general, is an elevation of the mind to God. But it is an elevation that is impelled by love, composed of only a few words, and directed like a dart to God, that He may know the holy affections and desires of the soul. Like arrows that shoot directly toward their target, these prayers leap, as it were, from the soul directly to God. Strictly speaking, not all short prayers are aspirations, although we often call them such, because aspirations are the effect of actual charity, expressions of love that burns in the soul. We know that some short prayers are able to be motivated by faith and hope without charity. For ex­ample, a person in mortal sin might call out to God to be relieved from terrible physical pain. Such a prayer, motivated by faith and hope in the power of God, may appear to be an aspiration, but, in the sense that we use the word, it is not such. Aspirations, in their full sense, must be born of love, of actual charity which moves the soul to cry out to God. Aspirations, therefore, are expressions of love, sighs of the hidden desires of the soul. They are not long, drawn-out prayers, but consist in a very few words, as for example, “My God, I love Thee.” When these desires of love are prolonged and a loving conversation ensues between the soul and God, this prayer is no longer called the prayer of aspirations, but a colloquy. Not all lovers love with the same ardor, and since aspirations have their foundation in love, it follows that the state of their perfection will vary with the degree of love that motivates them. We find people who practice aspirations rarely, and others, overwhelmed with love, who, as it were, seem to cling to God, breathing forth the desires of the soul almost constantly and without any pre­vious consideration of the intellect. Love runs away from and oversteps the ordinary processes of thinking. God comes into the mind of such people, and in a moment they think of Him and desire to be always united to Him. Even though it seems that there is no clear concept of God in the mind, the will seems to be directly moved by Him and the whole soul drawn into union with Him. This often happens to very holy people. This going out toward God, this loving awareness, is what really makes for intimate friendship. God, delighted with our love, responds with His own shafts of love, His divine graces, and, in a short time, the soul finds itself deeply in love with Him, conversing with Him in a most friendly manner. It would be a tragic mistake to identify the heart afire in the prayer of aspirations with joyous emotions and consolation. The aspirations, the desires, the sighs come from the soul and not from the senses. Even a soul steeped in sorrow may have them, for the prayer of aspirations is not an ecstasy of love that you can feel. It is true love that blooms in a desert of sorrow as well as in a paradise of joy. The feeling of joy may come or go, but the soul re­mains rooted in God, making known its desires to Him. It is obvious by now that when aspirations flow with regularity and have become habitual, the soul is well ad­vanced in prayer and has accustomed itself to live in the presence of God. Indeed, many spiritual writers consider the prayer of aspirations as the prayer of more perfect souls, as the fruit of fidelity to meditation. And rightly so. In view of this advice, it seems most advisable to ex­plain in some detail how beginners should employ aspira­tions. In the first place, let us dispel what might be a common error — namely, that an increase in the daily output of aspirations is progress. On the contrary, real progress in aspirations is measured by our growth in the love of God. One aspiration from the heart is worth more in the art of love than one hundred aspirations that tum­ble mechanically from the lips. If we are just beginning the practice of the presence of God, our aspirations will probably be few and not very natural. We must remember that the constant effort to use all occasions, all persons and things, to remind us of God will eventually bring our souls to fervent aspirations. And in the meantime, if no aspirations come naturally to us, we can use the ready-made aspirations of the saints or of Sacred Scripture. This use of ready-made aspira­tions, rather than being a forced practice, might even be called, as we have said before, another way to live in God’s presence, because the aspirations help keep our minds recollected, centered on God. It is well worthwhile to memorize those aspirations that appeal to us, provided that we do not content ourselves with mere mechanical recitation of them. It may happen that one particular aspiration suggests itself and is especially beneficial in keeping the mind and heart on God. In such a case, it would be foolish to look for variety. Remember the oft-told story of St. Francis of Assisi, who passed a whole night repeating slowly to himself this one prayer: “My Lord and my God!” Intensity of love, not variety of prayers, counts in our life with God. One thing is certain: we need not count our aspirations or the number of times we think of God. Perhaps faulty education in this fundamental point may be responsible for our almost total neglect of aspirations. A child, for instance, who for the entire Advent season made a thousand or more hasty aspirations a day, in hot competition with other members of his class for the honor of bringing the most “straws” for the infant Jesus to lie upon, is apt in later life to regard the practice of aspirations as senseless and repellent. Here, the original idea, to show and develop love for Christ, has often been perverted into the American system of mass-production, with the result that the child is too busy for love. We please God by loving Him and opening our souls to the Holy Spirit for enlightenment and inspiration. Those advanced in prayer need no booklet of aspirations. Their meditations and state of recollection will give them many holy thoughts to inflame their hearts. And a heart inflamed breaks forth naturally in loving aspirations. The exercise of the presence of God, with the accent on aspirations, should be the natural fruit of fidelity to daily meditation. Hence, priests and religious who are obliged to meditate daily should use their meditations as an aid to fervent aspirations, rather than neglect it under the pretext that they practice the presence of God and use aspirations frequently each day. Yet, when they are unable to make their daily meditation, for example, when sick or traveling, the use of frequent aspirations will be a most fitting substitute. Occasionally, we meet people who like to pray in quiet places or in church and, because they abhor a public manifestation of piety, look askance at the prayer of aspirations, which is recommended for all times and places. Such people should be reminded that the prayer of aspirations does not always call for vocal prayer or for the moving of the lips. Since the aspirations are really the desires and affections of the heart, they need not be externally manifested. There are other people who like to give God just so much of their time and no more, lest He interfere with their work. Aside from the obvious rejoinder that God has given them the day only so that they may save their souls, we can tell these people that there need be no conflict between their work and prayer. It is impossible to be deeply occupied with both work and prayer at the same time. But at least we can always turn our minds to God and away from useless or even sinful thoughts, whenever there is a moment free from other mental work. And we can train ourselves to be so habitually inclined to God that, even when engaged in strenuous tasks, we can raise our hearts to Him from time to time in the prayer of aspirations. We can imitate this practice of St. Bernardine, changing the aspirations if we find such bursts of ardent love out of harmony with our own imperfect state of soul. Certainly, none of us who are really sorry for our sins should find it difficult to substitute the following aspirations: “Jesus, have mercy on us.” “Jesus, forgive my sins.” “Help me never to sin again.” “Jesus, teach me to love Thee.” These are just suggestions. Let each one, guided by the Holy Spirit, choose his own. and let the clouds rain down the Just One! Let the earth open and bud forth a Savior! send Him whom Thou art to send! Come, O Lord, and visit us in Thy peace. The prayer of aspirations, to repeat, admits of many degrees. If we are beginning the practice of the presence of God, we can use aspirations to keep our minds on Him. If we are already recollected, already living with God, we will find our souls moved to break forth in fervent bursts of love, for this is the prayer of aspirations in its full growth. In this state, we should give free reign to these holy desires, recognizing them as the reward for living in God’s presence. They are a sign that we are deeply in love with God, that we are already engaged in a loving conversation with Him. The more frequent and fervent these desires and longings become, the more brightly will love burn in our souls. And for this God created us. Editor’s note: This article is adapted from a chapter in Fr. 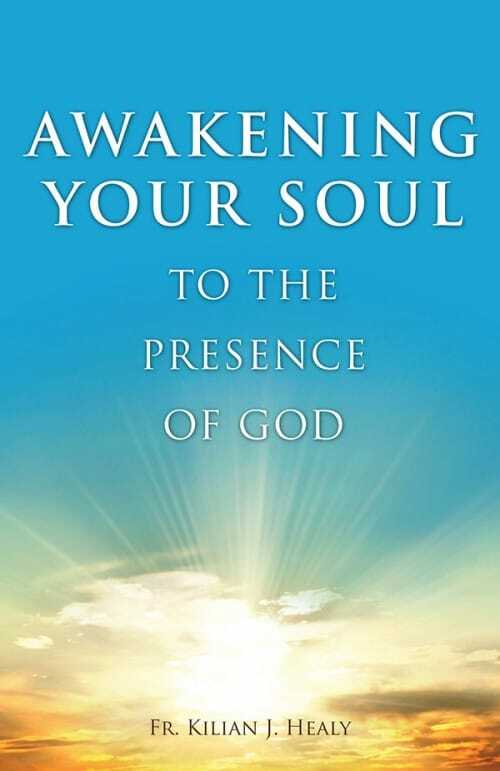 Healy’s Awakening Your Soul to the Presence of God, which is available as a paperback or ebook from Sophia Institute Press. The featured image is from the interior of Notre Dame Basilica in Montreal and is provided by serkan senturk / Shutterstock.com. Fr. Killian J. Healy, O. Carm (1912-2003) was a Carmelite priest who served as the Prior General of the Order from 1959-1971. He wrote widely on prayer and spirituality throughout his life and directed many people, lay and ordained, into a deeper life with God. His books are currently being reprinted by Sophia Institute Press.